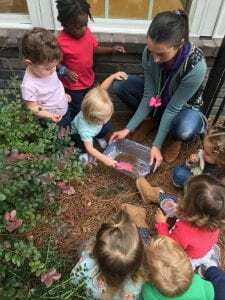 The children of our Toddler A class demonstrated an interest in observing the different elements of nature while outside. To promote this interest, we began collecting materials outdoors and bringing them into the room. We investigated their colors, sizes and textures. Could the children create simple patterns and designs? We used visual inspiration of mandalas and then encouraged children to create their own. When collecting our mandala materials, we found that the children loved digging in and sifting through the dirt. We discovered so many varying colors and textures within this simple element. Children used magnifying glasses and sheets to look more in depth at the ground. 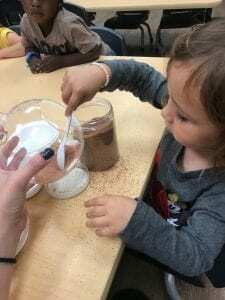 We chose to follow this interest and investigate the many types of dirt, soil, sod, etc. How are these elements used for growth? 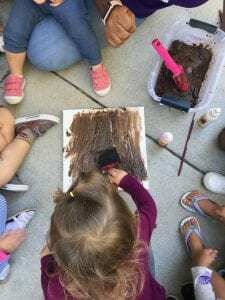 How can we add other natural elements, such as water, to change the consistency of the dirt? We created canvases with mud paint. We looked at layers of the earth and created a bin for investigation and learning with the natural materials. We have loved seeing the art pieces children have created during their investigative process.